Home » PIllows » What’s the Best Memory Foam Neck Pillow? What’s the Best Memory Foam Neck Pillow? Pain in the neck can shoo away sleep on most nights, but many people with neck pain swear by memory foam neck pillows. If neck pain is keeping you awake, you might want to try out memory foam neck pillows, considered best for neck pain by many. Read on to find out what advantages memory foam pillows offer, how to pick a neck pillow, and our review of some of the best memory foam neck pillows. What are the benefits of a memory foam neck pillow? Memory foam pillows are some of the top pillows on today's market. They are much heavier than the usual traditional pillow. Thanks to its higher density, memory foam is able to provide great support to the neck and other parts. The density range of standard foam is one pound per cubic to five pounds per cubic. Its density is a measure of quality; that is, higher the density, the better the quality of the foam. Memory foam responds to weight by molding itself to the shape of the object. And because it does that, your head and neck sink in more deeply, reliving pressure on your neck and shoulders. It's also a dust mite resistant material. As it is made of open cells, which basically means that there are air gaps between cells, dust mites are reluctant to live in them. There are memory foam pillows for specific body parts. For example, memory foam neck pillows are specifically made to provide better support to the cervical vertebrate. A good neck pillow relieves neck pain, gives you a chance to rest, and speeds up the healing process. An ineffective pillow does the opposite and can even exacerbate the root causes of your neck pain. So choose wisely! Some pillows are specifically for side sleeping, some for sleeping on the back, and some for both. Needless to say, your pillow must be suitable to your sleeping position. Sleeping on the stomach is not recommended, but there are special pillows for this position too. If you are a back sleeper, you would want to buy a thinner pillow, which ensures your head does not throw too much forward. On the other hand, side sleepers require a firmer pillow to fill in the distance between their ear and the outside shoulder. You may not need a pillow for the head if you sleep on the stomach. However, you would want to tuck a very thin pillow under your stomach. Doing so can help prevent back pain or provide relief from it in case it’s there. Choose a neck pillow according to your height and weight. Big, bulkier guys will need a bigger pillow, while a small one will do just fine for petite women. Last but not the least, take into account the filling material. As mentioned before, for neck pain, memory foam is considered a great option. Two other pillow fillings you can consider are down-feather combination and fiber. With a down-feather pillow you can press the stuffing around to get the maximum support where you need it. If you are asthmatic or prone to allergies, you might not want to use feather-based pillows. Fiber pillows are less expensive than down pillows. However, fiber pillows, especially polyester fiber ones, may not last as long as down pillows. Memory foam pillows offer many useful advantages, but are they better than down feather pillow? Choosing a pillow is a personal decision that should be taken after considering many factors. That said, the following report (a comparison of both varieties on some most important factors) might help you make a more informed decision. Softness – Down pillows are known for their softness. However, softness may not be the best thing when you have neck pain. If the pillow is too soft, it will fail to aptly support your head and it will sink in, resulting in poor alignment of the cervical vertebrate. Memory foam pillows are firmer than down pillows, and so are more suitable in neck pain. Support – Memory foam pillow contours to your head, neck, and shoulder, giving you great support. Allergens – Down-filled pillows may not be best for people prone to allergies as they are not dust mite resistant at all. Memory foam, on the other hand, is. Odor – Memory foam pillows have a slight odor. With down-filled pillows, however, there’s no such issue. How do I get rid of the odor of your new memory foam pillow? Most memory foam pillows can have an irritating odor, usually not too strong, but it may still be enough to prevent you from using them straightaway. In most cases, airing the pillow for a few hours should suffice. If it does not, remove the cover and speckle some baby powder over the foam. If even this doesn’t do the job, the only option is to throw the pillow into the washing machine and air-dry it. The Sleep Joy ViscoFresh Pillow comes with an indentation in the front. The pillow fits the contours of your neck and head well and is able to provide great neck support. It works well for most back sleepers and side sleepers. The pillow is a little on the softer side, making it a good option for those who like soft pillows (but perhaps not so much for those who prefer thick pillows). Another advantage is that the fabric breathes nicely and is efficient in wicking away moisture. You won’t feel warm even after several hours of use. The pillow has a “green tea” smell to it. It’s not much, but you will notice it. Some like it and some don’t. The good thing is that there is no chemical smell, which can trigger bouts of sneezing in people who otherwise are not hypersensitive to smell. This is a thick pillow—not super thick, but thick nevertheless. It does provide good support to the neck and the head. However, someone with a shorter neck may find the 5-inch thickness a little too much. The pillow has a medium firmness. It is not exactly fully plush, but nor is it very firm. 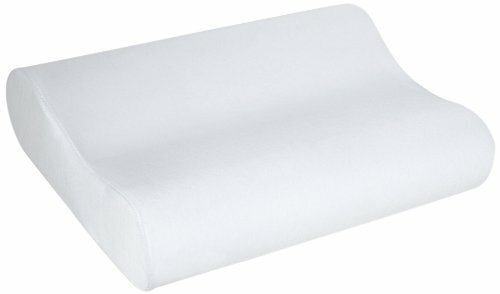 If you are used to firm pillows, using this, at least for first few days, can be a new thing for you. Another good thing about this pillow is that it does not let heat buildup, something you cannot say about some other memory foams. The memory foam is perforated, which makes air flow possible, creating a cool sleeping environment. The Conforma Pillow has a strong chemical smell. As it is washable, you are likely to put it in the washing machine, rather than under your head, on opening up. After a good wash, the smell shouldn’t be a bother. The Iso-Cool Memory Foam Pillow is firm, but not too firm. It is thick, but not too thick—a good option to consider for those who like medium firmness and medium thickness. The pillow provides good neck support, but it is designed for side sleepers. The pillow uses the Microscopic Phase Change (MCP for short) beads, which ensures that the pillow remains warm in low temperature and cool in high temperature. The pillow is made in America. Those who prefer products manufactured at home will have another reason to consider this pillow. The Iso-Cool Memory Foam Pillow does smell a bit when you unwrap it. The good thing, however, is that the smell dies out fairly quickly. You won’t necessarily feel the need to throw it into the cleaning machine (yes, it is washable) upon opening up to get rid of the smell; letting it breathe for a few hours will suffice. The Sleep Innovations Reversible Pillow gives you two different surfaces, one firmer than the other, making it ideal for those who are using the memory foam for the very first time. This feature will also appeal those who sometime like a soft pillow and sometime a firm one. The memory foam side does provide good neck and head support, while the down-like fiber fill gives the same level of comfort you find in traditional pillows. Its 2-in-1 design also make it suitable for multiple sleeping positions, which is surely a plus point for those who change their position during the course of their sleep. The pillow breathes easily on both the sides, so you don’t feel warm regardless of which side you are sleeping on. One drawback is that there is a little doubt about its durability. Some users who bought it have reported back that the pillow lost its firmness after a few months. Other than this, the Sleep Innovations Pillow scores well on all other points. The Sleep Innovations pillow has 2 lofts, allowing you to comfortably sleep in multiple positions. When sleeping on the side, use the higher loft. The lower raised edge is best suited for sleeping on the back. The pillow is neither soft nor hard—it has a medium-firm feel to it. As it uses memory foam, the pillow contours head, neck, and shoulder well, making it a good option for those with neck, shoulder, or back pain. Thanks to the open cell technology, the pillow doesn’t retain heat, ensuring you don’t feel hot as you sleep. 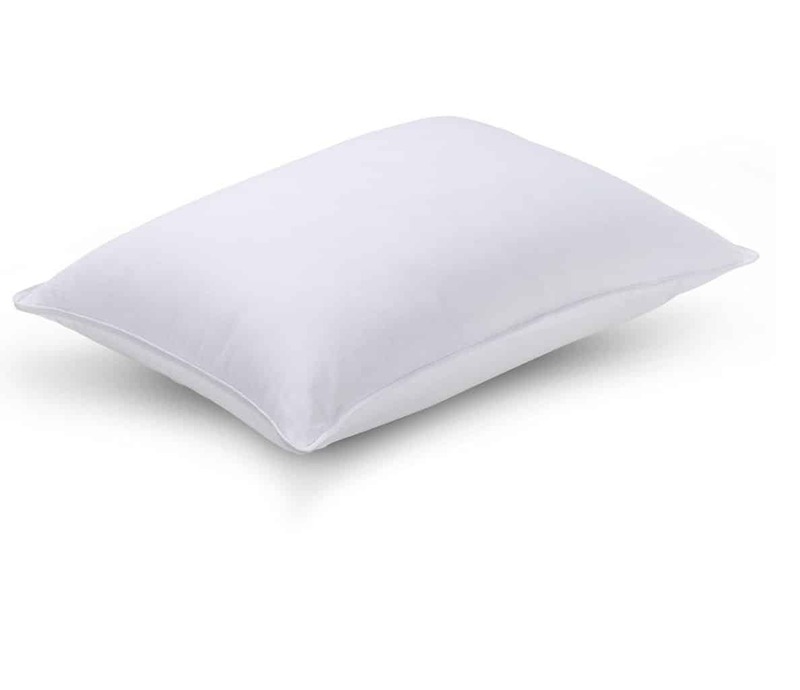 This memory foam pillow comes with a soft cover, which is machine washable. As the pillow is mite and allergen proof, allergy sufferers will not face any problem in using it. One gripe I had with it is its smell. It’s strong and unpleasant. A generous use of a freshener may be needed to drown the smell. Else, you may have to let it sit in another room for a few days.